For other people named George Steele, see George Steele (disambiguation). William James Myers (April 16, 1937 – February 16, 2017), better known by his ring name George "The Animal" Steele, was an American professional wrestler, school teacher, author, and actor. His career lasted from 1967 until 1988, though he made occasional wrestling appearances into the 1990s and 2000s. Steele portrayed Swedish wrestler and actor Tor Johnson in Tim Burton's film Ed Wood. Myers was born in Detroit on April 16, 1937, and was raised in Madison Heights, Michigan. During high school, he found success in track, baseball, basketball, and football. In 1956, Myers entered Michigan State University as a football player for the Michigan State Spartans, but his career as a football player was immediately cut short as a result of knee problems. In 1961, he was with the Grand Rapids Blazers (UFL). After earning a bachelor of science degree from Michigan State University and a master's degree from Central Michigan University, Myers became a teacher, amateur wrestling coach, and football coach at Madison High School in Madison Heights, Michigan. There he would eventually become a member of the Michigan Coaches Hall of Fame. Looking to supplement his income, he got into the world of Detroit-area professional wrestling, but in order to protect his privacy, he wrestled using a mask and the name The Student. Gary Hart served as The Student's manager and had to explain to the announcers why his client could not apply any legitimate holds or maneuvers instead relying on only his undisciplined brute strength. Myers was soon scouted by World Wide Wrestling Federation (WWWF) champion Bruno Sammartino and began working in Pittsburgh in 1967 on the popular Studio Wrestling TV show broadcast on WIIC-TV (later WPXI-TV) Channel 11. Sammartino had liked the character Myers developed of a wild man with incredible strength. However, he had him drop the mask, as well as the title of The Student. Looking to hide his real name, Myers opted for the alias "George Steele". According to Michigan High School Hall of Fame Coach George Steele of Warren, he and Myers were coaching against each other in a high school JV match-up while both were early into their careers. At halftime, Myers approached Steele and told him about his venture into wrestling and that he was looking for a name. Myers allegedly asked Steele if he could use his name, that he liked it a lot and the future Hall of Fame coach told him no problem. Steele states in an interview available on YouTube that he was in Pittsburgh when he was looking for a stage name. Local wrestler "Jumpin'" John DeFazio suggested Jim Steele since he was in the "Steel City". He didn't like the first name Jim and he suggested George which is what he eventually went with. Working well with Sammartino, he was invited for a full run in the WWWF. He told WWWF TV commentator Ray Morgan that he was the nephew of Ray Steele (kayfabe) and had an extensive amateur background. He sold the story by using an array of armlocks on opponents, weakening them for his finisher, the Flying Hammerlock (Steele would lift his opponents off the mat by a hammerlocked arm). He also revealed his teaching background to interviewers that made his in-ring Neanderthal image all the more incongruous. He wrestled Sammartino to an hour-long draw at Madison Square Garden but lost the rematch. In Boston, being set up to face Sammartino for a long series in that city, he got one of the few clean wins over Victor Rivera, a top babyface, with the flying hammerlock submission, at a huge Fenway Park outdoor show. He was then relegated to a feud with Chief Jay Strongbow, and lost to Edouard Carpentier at the Garden before taking a brief hiatus to reinvent his wildman character. Steele became a true crazy heel, acting like a wild man in the ring, tearing up the turnbuckle with his teeth and using the stuffing as a weapon as well as sticking out his green tongue (an effect accomplished by eating green Clorets breath mints). The Animal had a stooped posture and a hairless head, but a thick mat of fur on his back; wrestling broadcasters often speculated that The Animal was indeed "the missing link". At best, The Animal could occasionally manage to utter a word or two during interviews with one of them usually being "Duh-da-dahh" or "YOU! YOU go!" As Steele recalled in a later shoot interview, his infamous "Duh-dahh" interview style happened by accident. Throughout his career, Steele prided himself on being able to cut eloquent and effective promos and ranked his mic skills with the best in the business. At a WWF TV taping in the early 1980s, he was cutting one of these promos when Vince McMahon cut him off and reminded Steele that his gimmick was the "Animal", and for an animal, he was "making too much sense". Incensed, Steele did a second take of nothing but garbled and incoherent syllables ("Duhh-dahh"). Steele did this deliberately and out of pure frustration, thinking that McMahon would acquiesce and allow Steele to cut his normal, eloquent promos. Much to Steele's shock, McMahon replied, "That's exactly what I want! ", and this would remain Steele's interview style for the rest of his WWF run. Steele started to fully cultivate his gimmick of a menacing imbecile. Steele eventually became one of the more popular and recognizable wrestlers during most of the 1980s professional wrestling boom. He turned face during the first episode of Saturday Night's Main Event when his partners in a six-man match, Nikolai Volkoff and The Iron Sheik, abandoned him to their opponents, Ricky Steamboat and the U.S. Express (Barry Windham and Mike Rotunda), leading to Steele being taken under the wing of the Express' manager, Capt. Lou Albano, who consoled him following the loss. His most famous feud was in 1986 against "Macho Man" Randy Savage, after Steele developed a crush on Savage's valet, Miss Elizabeth. The feud was meant to last only a couple of months (and end with Steele being disappointed), but it proved so popular with fans that it continued well into 1987. During Savage’s Intercontinental Championship match against Steamboat at WrestleMania III, Steele—who was in Steamboat’s corner—twice interfered in the match. First, he took the ring bell from Savage as he attempted to use it off of the top rope. Secondly, after Savage kicked him and took the bell back, Steele shoved Savage off of the top rope, allowing Steamboat to roll up Savage for the pin to win the championship. In 1988, Steele began carrying a stuffed animal named "Mine" to the ring. He participated in the Wrestlemania IV Battle Royal but was outside of the ring the whole time. According to Steele, he suffered a knee injury at a house show prior to the event, which was the reason he didn't get in the ring. Late in 1988, Steele retired after being diagnosed with Crohn's disease. Steele then became a road agent for the WWF until he was released in October 1990 due to budget cuts. Soon after, however, Steele was re-hired by the WWF and continued to work as an agent until the late 1990s. Though he left the WWF without any WWF championships behind him, Steele grew to become one of the most recognized and popular figures in WWF history and was inducted into the WWF Hall Of Fame class of 1995. In 1998, during the WWF's "Attitude Era", Steele returned as part of The Oddities. Then on January 10, 2000, he appeared on an episode of WCW Monday Nitro as one of three legends Jeff Jarrett had to face that night. Eight years later, Steele made an appearance at TNA Wrestling's 2008 Slammiversary pay-per-view event as a groomsman in the wedding for "Black Machismo" Jay Lethal and SoCal Val, along with Koko B. Ware, Kamala, and Jake "The Snake" Roberts. Steele made a surprise appearance on Monday Night Raw on November 15, 2010, during a match between Kofi Kingston and David Otunga. Myers had dyslexia and was diagnosed with Crohn's disease in 1988, an inflammatory bowel disease that currently has no cure, but can be brought into remission. In 1998, doctors told Myers that his Crohn's Disease had gone into remission and that he no longer suffered from any of the disease's symptoms. In 2002, to prevent the symptoms from returning, Myers had his colon removed. Myers was a devout Christian. He attended the First Baptist Church Merritt Island and lived in Cocoa Beach, Florida, with his wife Pat, whom he married before he entered Michigan State in 1956. Together, Pat and Jim had two sons, Dennis and Randy, and a daughter, Felicia. On February 16, 2017, Myers died in hospital care due to kidney failure, at the age of 79. In 1994, Steele made his professional acting debut as Swedish wrestler-turned-actor Tor Johnson in Tim Burton's Ed Wood. Coincidentally, Steele was often mistaken for Johnson earlier in his career. According to Steele, a New York novelty shop once sold a Tor Johnson mask as a George Steele mask to increase sales, due to Steele's popularity at the time. In 2008 Steele co-starred with Greg Valentine in a short film entitled Somethin Fishy, in which the two former wrestlers purchase a fishing camp. The film served as the pilot for a comedy series that was not developed further. Steele also appeared in a Minolta commercial with actor Tony Randall. Steele appears in the video game WWE SmackDown! Here Comes the Pain as a legend character. He is also featured in all three games in the Legends of Wrestling series. His book, "Animal", was released on June 1, 2013. 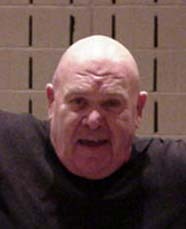 A song about Steele titled "George Steele" appears on the album Charmed Life by punk rock band Half Japanese. The lyrics include "There's a man who I admire, a man who set his hair on fire." Steele is referenced in the Seinfeld episode, "The Bizarro Jerry". Repulsed by the "man hands" of his current girlfriend, Jerry complains, "I feel like I'm dating George 'The Animal' Steele." PWI ranked him # 267 of the 500 best singles wrestlers during the "PWI Years" in 2003. ^ a b c d "George Steele's profile". Online World of Wrestling. Archived from the original on May 24, 2011. Retrieved 2011-04-24. ^ a b c d e f g Solomon, Brian (2006). WWE Legends. Pocket Books. pp. 231–235. ISBN 978-0-7434-9033-7. ^ a b c "Professional Wrestling Hall of Fame – George The Animal Steele". Professional Wrestling Hall of Fame and Museum. Archived from the original on September 7, 2011. Retrieved September 9, 2011. ^ Maslin, Janet (September 23, 1994). "Ed Wood (1994) Film Festival Review; Ode to a Director Who Dared to Be Dreadful". New York Times. Retrieved April 17, 2012. ^ "HugeDomains.com - GeorgeSteele.com is for sale (George Steele)". www.hugedomains.com. Retrieved May 7, 2018. ^ "1961 Grand Rapids Shamrocks - The Pro Football Archives". www.profootballarchives.com. Retrieved May 7, 2018. ^ Hart, Gary (2009). My Life In Wrestling: With A Little Help From My Friends. United States Of America: GEAN Publishing. pp. 15–18. ISBN 0692000461. ^ "George "The Animal" Steele Talks Wrestling Career, Pittsburgh Connection". KDKA.com. Retrieved February 17, 2017. ^ "George 'The Animal' Steele passes away at 79 years old". WON/F4W - WWE news, Pro Wrestling News, WWE Results, UFC News, UFC results. February 17, 2017. Retrieved May 7, 2018. ^ "George the Animal Steele - June 8 | MiLB.com Open Category 2 | The Official Site of Minor League Baseball". MiLB.com. Retrieved May 7, 2018. ^ "Somethin Fishy Film Pilot". YouTube.com. Retrieved February 19, 2017. ^ Sonnenberg, Maria (July 27, 2014). Stover, Bob (ed.). "The Animal pins problems to the mat". Florida Today. 49 (133). Cocoa, Florida: Jeff Kiel. p. 5E – via Newspapers.com. ^ "George Steele — Half Japanese | Last.fm". Last.fm. Retrieved May 7, 2018. ^ "man hands". The Seinfeld Dictionary. July 1, 2010. Retrieved May 7, 2018. ^ "Superstars of Wrestling Canadian Heavyweight Title". Retrieved April 25, 2015. 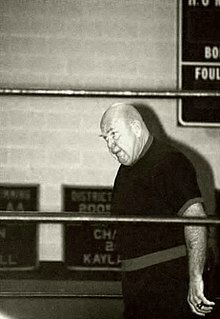 Wikimedia Commons has media related to George Steele.